The study done by researchers at the University of Texas at Austin had two focus points for urban residential areas: (1) to identify neighborhoods or groups within neighborhoods that are vulnerable to displacement, and (2) to identify strategies and policies to prevent displacement. Through analysis of vulnerability, demographics, and housing market changes in neighborhoods of Austin, locations were assigned as one of five types of displacement risk. To accompany the analysis, maps were created that are available in the document as well as a web-based tool. The document also presents case studies of three neighborhoods—in Washington D.C., Austin, and Portland—that are fighting displacement as well as the policies that are being used to prevent it—like legal protections for tenants, city support for affordable housing, and land trust programs. The authors include more details about possible an array of policy solutions as well as funding strategies. Understanding that all practices will not be suited for every location, the team also included evaluation criteria to assess different anti-displacement policies so that decision-makers consider which of the strategies are best suited to meet their needs. Citation: Heather Way, Elizabeth Mueller, and Jake Wegmann. 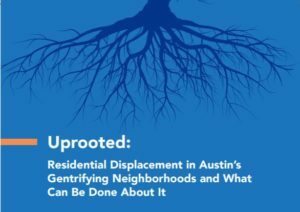 Uprooted: Residential Displacement in Austin’s Gentrifying Neighborhoods and What Can Be Done About It. The University of Texas Center for Sustainable Development in the School of Architecture and the Entrepreneurship and Community Development Clinic in the School of Law, 2018.